In our continuing coverage of acquisitions and transfers of IBM patents, Envision IP analyzed recent IBM patent assignments from 2016 through 2017. 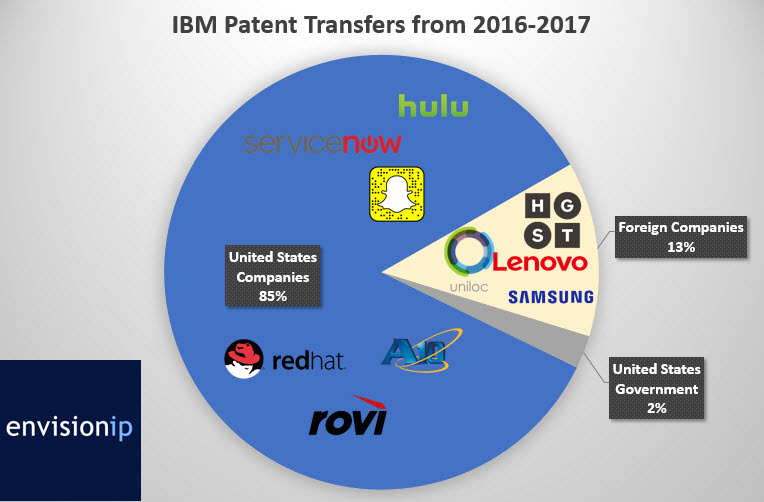 Our previous analysis included IBM patent transfer through 2015. At that time, notable acquirers of IBM patents included Google, Alibaba, Twitter, and Facebook, with the latter three coming off IPOs in recent years. ServiceNow is a cloud computing company that offers various IT services and products related to cloud management for enterprise. The company owns 347 US patents. The IBM patents account for approximately 40% of the company’s US patent portfolio. Hulu, the video-on-demand streaming service, owns 220 US patents. The IBM patents account for nearly 25% of Hulu’s US patent portfolio. As a comparison, IBM patents account for roughly 90% of Twitter and SnapChat’s US patent portfolios. Nearly 50% of the patent assignments over the last two years included patents related to cloud computing and remote data transfer, such as streaming and on-demand video. Of the 530 patents transferred during this time frame, 85% of the patents were transferred to US companies. 13% were transferred to foreign companies, and 2% were transferred to various entities tied to the United States government, such as DARPA, the U.S. Navy, and the U.S. Department of Energy. Interestingly, IBM does not appear to discriminate between operating companies and non-practicing entities when selling patent assets. Six patents were transferred to Uniloc, a holding company that is well-known for suing technology companies. Uniloc has sued Samsung Electronics America, Inc. and Red Hat in the past, both companies that have recently acquired patents from IBM. Along the lines of acquisitions by holding companies, IBM and Finjan recently announced a new subsidiary which involves the transfer of 25 IBM cybersecurity patents. The latest patent assignment data indicates that IBM has also transferred patents to organizations of various sizes, from fortune 100 companies, to start-ups such as Utopus Insights, which is an IBM-spin off.